'Windows boot manager' is set to 1 in the boot priority, with the SSD 2. I have tried swapping these around with no joy. If I click windows boot manager it boots up fine. Did you install the OS with more than one single hdd/ssd attached? Windows Boot Manager is the correct boot entry. I assume you installed Win 10 from a USB flash drive using a Win 10 ISO file? If so, it seems you did not select an entry in the boot order for the USB Win 10 installation media. That entry was, "UEFI: <flash drive name>". There was also an "AHCI:" entry for the USB flash drive. The "UEFI:" entry is not wrong at all. Actually in using that you "chose" to use the EFI bootloader instead of the Legacy bootloader. Nothing wrong with that either, better actually. Why are you concerned about that entry in the Boot order? Just never saw one like that in the past? Yes I installed windows from a USB Iso. Its a clean install on a Crucial MX300 750GB. The problem is that this screen pops up everytime I start windows, rather than just booting straight in. 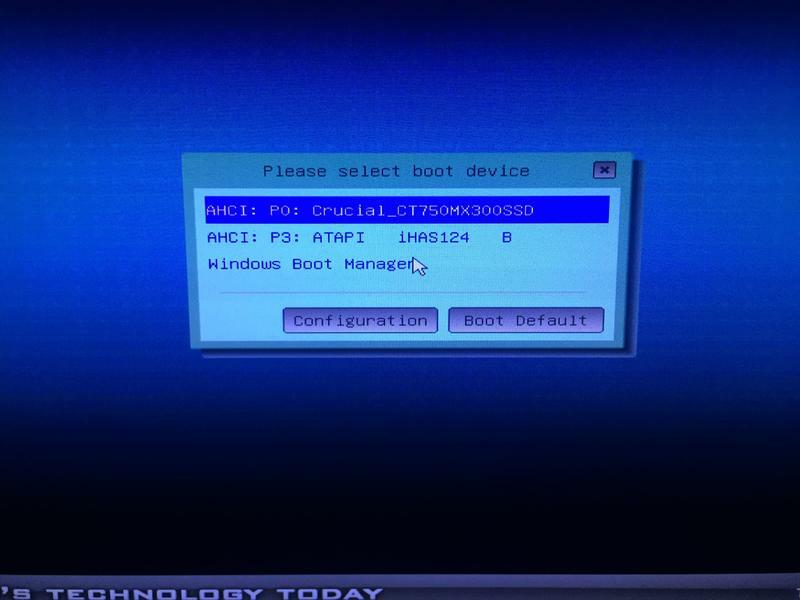 I also noticed this morning that the SSD has been formatted as MBR and is booting in Legacy mode?